Always a good day for a calf. She is the lead cow , raises a fine calf . it's nice when they know what they are doing. I noticed her off by herself saw a water bag from a 300 yrds she twisted a turned till it broke then she laid down an waited about 30 min I seen her start pushing and she would roll way over push and then come back cow fashion took a bout 10 min of doing this and calf was out . licked head first and he was up sucking within an hour. She was 10 days over a yr since last calf but her avg is still 358 days . I have her last 2 heifers in herd. My lead cow also graced me yesterday with a little heifer. Nice photos everyone, great time of the year for many of us with cows. A couple that hit the ground yesterday. He has some powerful bull calves on the ground, but I don't have those pictures on my computer yet. I love this thread seeing all these cute calves just makes me . The only downfall of being in the Angus business is all of ours are the same color. 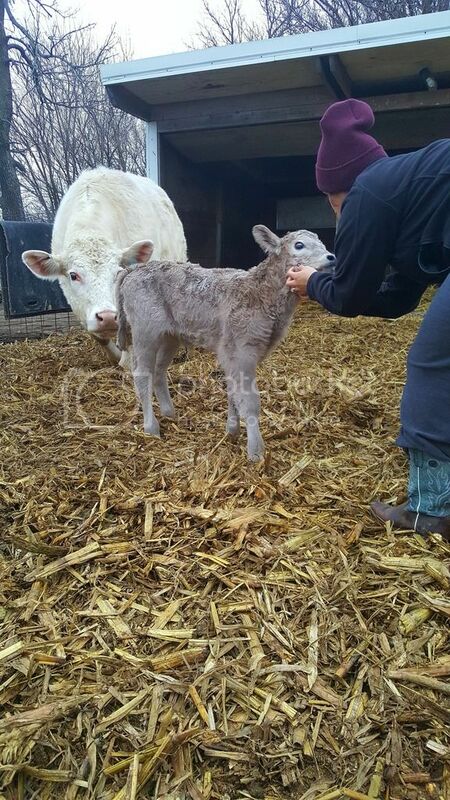 I confess to loving baby Herefords and black baldies chars and Brahman. Thanks to everyone that has shared their photos! Another one the old Herf bull got . Yesterdays calf.. from a really good cow and my homeraised bull.. super vigorous and momma stands for milking very nicely and is easy to work.. Another one i have high hopes for. Snapped a photo of the few Charolais calves I have.